Castillo, J., Díez , J.J., Jiménez, A.F., Núñez-Andrés, M.A., Monguet, J.M. 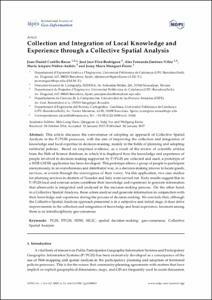 Collection and integration of local knowledge and experience through a collective spatial analysis. "International Journal of Geo-Information", Febrer 2017, vol. 6, núm. 33.